Most fresh flowers need nothing added to enhance their beauty. The colors and scents are a feast for the senses. 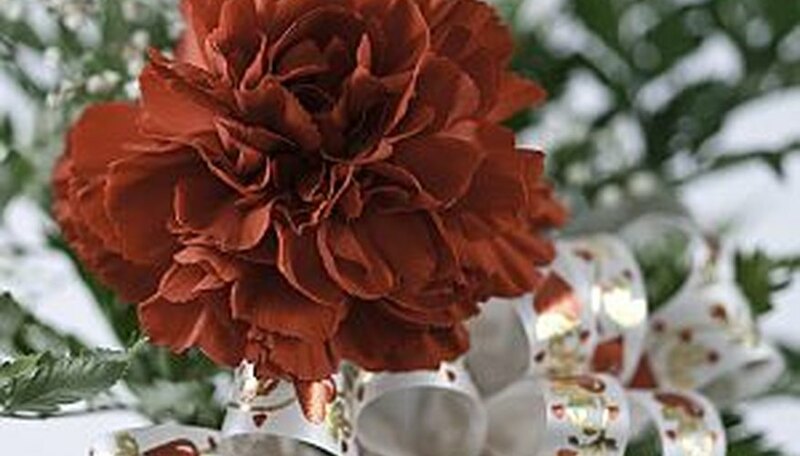 Make this beauty last by drying your fresh carnations. A microwave oven is an effective device for drying a variety of fresh flowers, including carnations. Follow the guidelines carefully for the drying and standing times, and you will be able to keep your carnations beautiful indefinitely. Fill a glass dish approximately halfway with silica gel. Cut the carnation stem so that the entire blossom and stem will fit into the glass dish. Cut the stem short, or leave it as long as possible for it to fit into the dish. Place the carnation into the silica gel in the glass dish with the stem facing down and the blossom facing up. Tip the dish to each side so that the silica gel covers the flower completely, adding more silica gel if necessary. Place the glass dish in the microwave oven. Fill a glass measuring cup to the top with water and place it in the left, back corner of the microwave. Set the microwave for two minutes on high temperature and start. Rotate the glass dish 180 degrees and microwave for one additional minute. Remove the glass dish from the microwave and place it in a safe location to cool and dry. For best results, allow the flower to sit undisturbed for six hours. If you remove the flower from the silica gel before it is dried, it will not stay firm. Lift the dried carnation from the silica gel after the six hours and use it however desired as a dried flower.